Sold out edition of 26 units, impossible to find in new/boxed condition. 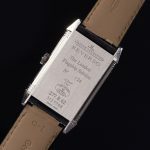 Continuing the special edition tribute to Reverso 1931, in 2015 JLC created the rarest Reverso yet, with only 26 pieces: the London edition. 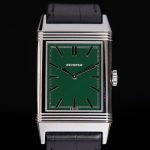 It featured a deep racing green lacquer dial, a color often associated with England and in particular with car racing in London. 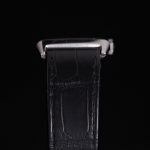 The demure dial, with no brand name visible, shows at the top third simply the word “Reverso,” as is fitting of a piece so distinguished. A metallic railroad minute track keeps the minimal design intact, as do the metallic sword hands. 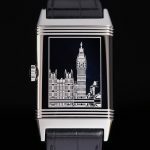 The reverse side of this ultra thin watch features an engraving of Big Ben and the Palace of Westminster drawn by Janek Deleskiewicz, JLC’s artistic director, viewed by pivoting the case to expose the reverse side. As is fitting, this model was only available at the flagship boutique on 13 Old Bond Street in London and saved for special customers who made an in-person visit. Sold out long before it arrived on the broader market, it achieved an immediate legendary reputation.